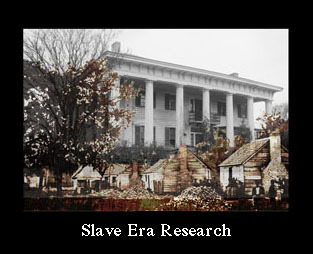 Thomas McDougal was born into slavery about 1839 in Larue County Kentucky. 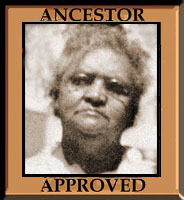 His mother was Fannie McDougal and his father, Ephraim Martin. He was the oldest of eight, including Georgeanna MacDougal, Thomas Ray Allen’s first wife. 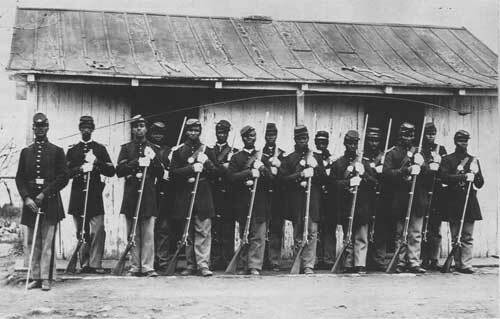 On July 14, 1864 he was mustered into Company “F” of the 107th Colored Infantry (USTC) in Lebanon, Kentucky. Looking at the records, it seems he was mustered in as a sergeant. He also mustered out as a Sergeant. Company F included many men mustered in from Lebanon, Marion County, which is next to Larue County, where Thomas McDougall lived. Below is a description of the movements of the 107th Regiment, United States Colored Infantry during the war. Thomas McDougal disappears from the end of the Civil War until I found him in Indianapolis in 1891 listed as a carpenter in the City Directory. In the 1900 Census he is living as a widowed roomer and working as a janitor. 1900 was also the year he testified for Thomas Ray Allen during his pension hearing, saying that he knew Thomas Allen to be who he claimed to be. In 1904 Thomas McDougal entered the U.S. National Home for Disabled Volunteer Soldiers in Grant, Marion County Indiana. He was 67 years old. 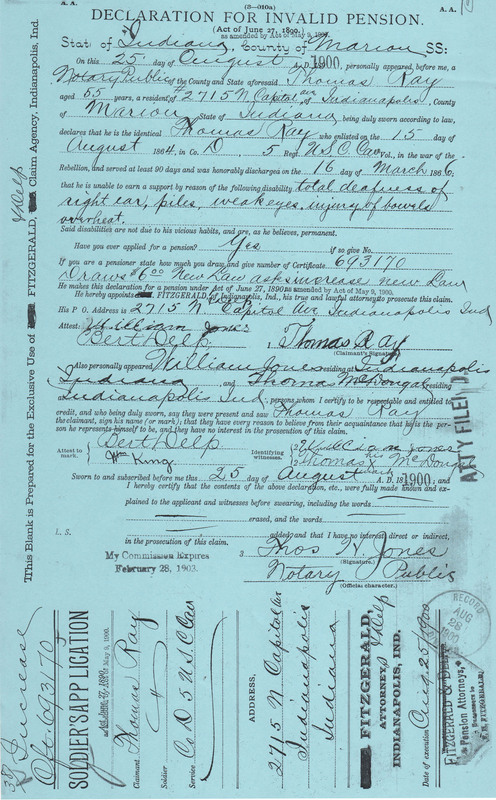 In the 1910 Census he was listed as 71, living at the Home and unable to read or write. He signed his testimony with an “X” above. On February 28, 1915, Thomas McDougal died of lobar pneumonia at the National Military Home. He had been ill from August 16, 1914 to February 28, 1915. This seems a long time to suffer from pneumonia, however I remember having pneumonia when I was six and being confined to bed for so long that when I finally was able to go back downstairs, I felt like I was in a new house. I also have to remember that there were no antibiotics at that time.His birth date is given as 1841 and his age as 74. He was a widower and his occupation was given as farmer. 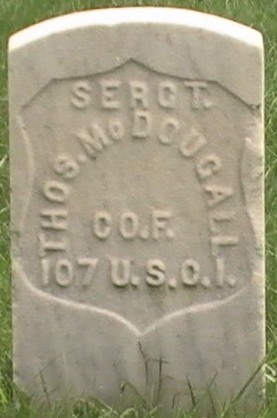 Thomas McDougal is buried at Crown Hill cemetery. His grave marker is above. I continue to be blown away by the level of your research. Quite the window into one person’s past, as well as the country’s past. 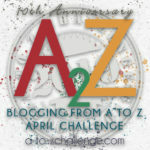 I wonder if I could design a postcard using the theme of my A to Z.
Wow, he was ill for a long time. I wonder if perhaps it was something else which finished up with pneumonia. I think the lack of antibiotics explains the long periode of illness. We don’t really realise how much our lives were changed by antibiotics. Despite the long and unfortunate illness at the end, he leaved a long and eventful life. I suppose they all are, though we may not realize it at the time, but who knows what highlights some stranger will pick out 100 years from now? Wow– what an interesting life! And you must be really good at research to have gathered all this. How do you do it?